Continuing its commitment to nurture learning, Chicago Public Library presents STEAM-POWERED SATURDAY, a day-long series of events and activities introducing STEAM (Science, Technology, Engineering, Art and Math) disciplines to children ages 3 to 11 and their families. The free event takes place on Saturday, April 9 from 11 a.m. to 3 p.m., at the Harold Washington Library Center, 400 S. State St. A variety of activities will be held in the Grand Lobby (1st floor), Thomas Hughes Children’s Library (2nd floor), Winter Garden and South Hall (9th floor). 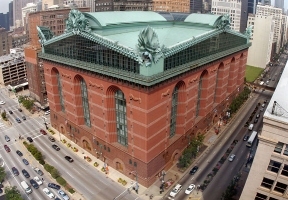 For more information, please visit chipublib.org, or call (312) 747-4780. Chicago Public Library, in collaboration with partner institutions in Chicago, supplements traditional education with high-quality programs for children aimed at building literacy and fostering other 21st century skills. STEAM-POWERED SATURDAY exemplifies this initiative! The fun-filled, interactive learning event, cosponsored by the Chicago Public Library Foundation and ScienceConnections, introduces children and their families to the variety of ways that science plays a part in their everyday lives.